The Walmart in Ware, Mass. has a sign telling employees — Walmart calls them "associates" — what the Walmart stock price is. "Today's stock quote...tomorrow depends on you," the sign says. A sign inside a Walmart in Ware, Mass. Walmart's stock performance over the past 20 years has been nothing spectacular, which may tell something about the limits of both motivational signs and in-store associate performance in the face of broader economic trends and competition. Or it may just say that after a period of spectacular growth, some leveling off was inevitable. 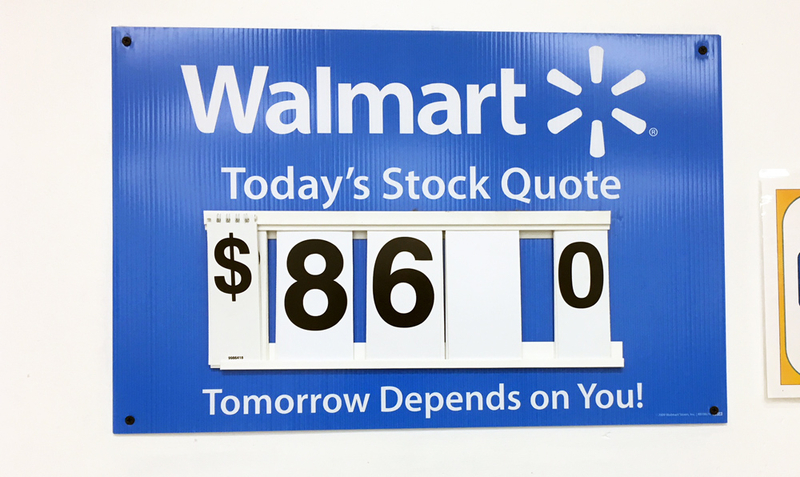 Putting the sign where customers can see it is a subtle reminder to the customers that Walmart is a publicly traded company that they can buy a piece of, and share in the growth of, if they choose to. And it's a reminder to associates that they can participate in the company's associate stock purchase plan, in which Walmart "matches $0.15 for every $1 you put into the Plan through payroll deductions, up to the first $1,800 that you contribute in each plan year." It may seem like a stretch that the price of a huge company like Walmart would be affected by the behavior of a single associate "you." Maybe a single day's stock price is too short-term a measure on which to focus. But getting employees to think like owners, and to feel personal responsibility for the company's financial success, is surely one of the secrets to success in business. Long term, Walmart has been an amazing business success story, creating a lot of value for a lot of customers and shareholders, and surely signs like this, and the thinking they indicate, have played some role. It's harder to put up a sign like that in a privately held company, or in a nonprofit, but everyone has metrics, and in a public company, the stock price is one that, over time, provides a certain reality check. Some earlier Walmart coverage at FutureOfCapitalism may be found here, here, here, here, here, and here.